'How high?'' ''How high?'' ''How high?'' Our family had been reciting that phrase a thousand times every morning before gulping down the last of the FIFA-approved, South Africa 2010 muesli. You just can't be too prepared when you are engaged in a cut-throat international bidding campaign. Why the chant? The FIFA World Cup committee was in town this week inspecting facilities and we didn't want to be caught off guard if the delegates asked us to jump. Yes, I know Australia's 2022 World Cup bid is in the experienced and all-above-board hands of foreign experts who are being paid the fair market rate - the market for soccer lobbyists, presumably, being set in relation to the salary of Hollywood A-listers and Macquarie Bank office boys. But, as patriotic Australians committed to the concept of Australia hosting this culturally enriching and economically beneficial event, we felt we should not leave the heavy lifting to the hired guns. Nor should Football Federation Australia administrators have to tug all the forelock when they've got an A-League season to run - it would not be easy begging Clive Palmer not to relocate Gold Coast United to Mudgee with a pre-existing case of gravel rash. Which is why we pitched in - well, everyone except cousin Jeremy. 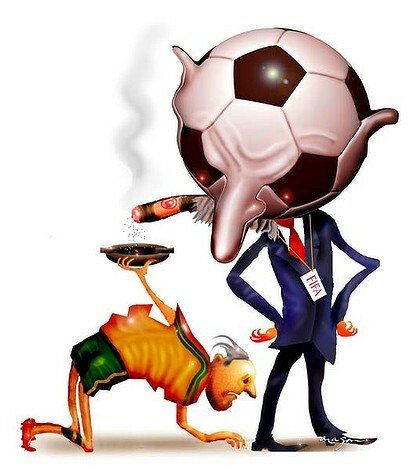 He believes FIFA is money-grabbing, manipulative and anti-democratic; that South Africans are still complaining about the excessive demands of the World Cup organisers and shaking their heads at how Nelson Mandela was virtually bullied into attending the final despite still mourning the death of his granddaughter. He said you could still buy ''Fick Fufa'' T-shirts in J-burg, which provided a chilling reminder: my 2022 bid ''Flatter Blatter'' T-shirts were still at the printers. Then we rang the FFA and offered to billet a delegate. However - you'll find this surprising - we were told they prefer to stay in luxury hotels, and there was probably no point making up the fold-out sofa in the spare room. We'll trust the highly paid experts on this, but I can't help feeling that when Mr Mayne-Nicholls hears he missed tuna casserole night, it could come back to bite us. The FFA also told us that they had lined up Cathy Freeman and John Aloisi to give a bit of a talk about their great moments at ANZ Stadium and my wife's native studies class would not be required to perform a ceremonial greeting. But the oldest boy had invented an official Australia 2022 annoying trumpet device, made entirely from toilet rolls. He calls it the loo-vezela. So we went out to Homebush and, as Aloisi re-created his spot kick, we jumped out in front of the delegation playing them at full force. Top that Qatar! FIFA'S media officer, Wolfgang Eichler, gave us a big smile - either that or the oysters from the harbour cruise had given him wind. And it took Ben Buckley at least a few seconds to alert security, so I'm pretty sure he thought the loo-vezela was a big vote winner. Then we waited at the train platform hoping to show the FIFA heavies our personal bid book - the youngest one had just finished colouring it in. But, apparently, they took a helicopter, flights from Homebush to Central now apparently covered by an all-zones daily pass.